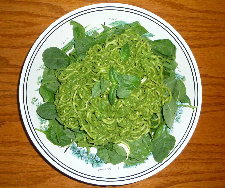 bowls and top each with half of the zucchini pesto noodles. Hi, don't you soak the nuts overnight to activate the enzymes lying in them? ***Yes, you certainly can. The hemp seeds don't need it though. Join in and write your own page! It's easy to do. How? Simply click here to return to Raw Pasta.